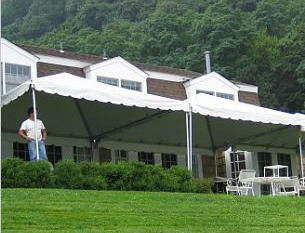 This size tent will fit up to 50 people around tables. It is a free-standing tent so it can be installed on any surface, but is recommended for use on decks, patios and driveways. (Requires space 17″x32″). Center peak adjusts from 10″9′ to 11″4′. Sides poles adjust from 7″ to 9″. The is no center pole.